If you came to this page directly and do not see a navigation frame on top, please go to the home page. Lunéville is situated at an elevation of 233 m at the confluence of the Vezouze into the river Meurthe in the département Meurthe-et-Mozelle, about 30 km southeast of the départements chef-lieu, Nancy. Lunéville is one of the sous-préfectures of the département (arrondissement Lunéville), and also the chef-lieu of the cantons Lunéville-Nord and Lunéville-Sud. The municipality has a population of about 20,100 (2008). In the 15th century the county of Lunéville became part of the duchy of Lorraine. 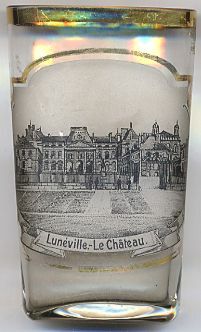 The flourishing period of Lunéville began in 1702 when Duke Léopold Joseph of Lorraine and Bar moved his residence here because his main residence, Nancy, was occupied by French troops. Lunéville remained a residence town until the death in 1766 of the last duke, Stanis&lstrok;aw Leszczy&nacute;ski. In 1735, the preliminary Peace of Vienna (made public in 1738) ended the War of the Polish Succession. By the terms of the treaty, Stanis&lstrok;aw Leszczy&nacute;ski renounced his claim on the Polish throne and recognized August III, Elector of Saxony as king August II of Poland. As compensation he received instead the Duchy of Lorraine and Bar, which was to pass to France upon his death. Stanis&lstrok;aw Leszczy&nacute;ski died in 1766. François III (François-Étienne) of Lorraine, who was the Duke of Lorraine, was indemnified with the throne of the Grand Duchy of Tuscany, upon the death of Gian Gastone de Medici (which ocurred in 1737). François (Franz Stephan), married to Maria Theresia of Austria in 1736, became Francesco II of Toscana in 1738 and was elected Holy Roman Emperor Franz I in 1745. In the treaty, France also agreed to the Pragmatic Sanction of 1713 which ensured that the Austrian throne and Habsburg lands could be inherited by a daughter in the absence of a male heir. In 1801, the Treaty of Lunéville, signed by Joseph Bonaparte for France and Johann Ludwig Count Cobenzl for Austria ended the War of the Second Coalition against Napoleon. The Treaty of Lunéville also was the basis of the Reichsdeputationshauptschluss of 1803 (formally the "Hauptschluss der außerordentlichen Reichsdeputation", or "Principal Conclusion of the Extraordinary Imperial Delegation", the last significant law enacted by the Holy Roman Empire before its dissolution by Emperor Franz II (Franz I of Austria) in 1806), which established a major redistribution of territorial sovereignty within the Empire, to compensate numerous German princes for territories to the west of the Rhine that had been annexed by France as a result of the wars of the French Revolution. The château de Lunéville [left] which had belonged to the Dukes of Lorraine since the thirteenth century, was rebuilt as "the Versailles of Lorraine" by Duke Léopold Joseph from 1703 to 1723, from designs of Pierre Bourdict and Nicolas Dorbay and then of the architect Germain Boffrand, whose masterwork it became. Stanis&lstrok;aw Leszczy&nacute;ski died here in 1766 from the injuries which he suffered in a fire in his room. Lunéville was classified a Monument historique in 1901 and by successive ordinances; its princely apartments are looked after by the Ministry of Defense while the structure is the responsibility of the Conseil Général de Meurthe-et-Moselle. On the night of 2 to 3 January 2003, a fire broke out that ravaged the château to the extent that the plaster vault of the Chapelle royale collapsed. Passing through the attics, the fire destroyed the roof over much of the structure. The restoration of the building and its decors is under way and is estimated to be completed in 2015.